If you're into productivity tips at all, you've no doubt heard about the Pomodoro technique. Just in case you haven't, here's a quick explanation: Instead of sitting down for a vague, extended time of studying or writing, the Pomodoro technique focuses on 25-minute sessions of concentration, followed by a short break. The limited time span and manageable Pomodoro session length is a great way to get yourself to just sit down and tackle a long to-do list. I love using Pomodoro timers for annoying tasks that I've been putting off - and seeing how I can often finish them within one or two sessions motivates me to keep going. Using the Pomodoro technique made me better at estimating how much time I'd need for individual tasks - very handy when planning my days! 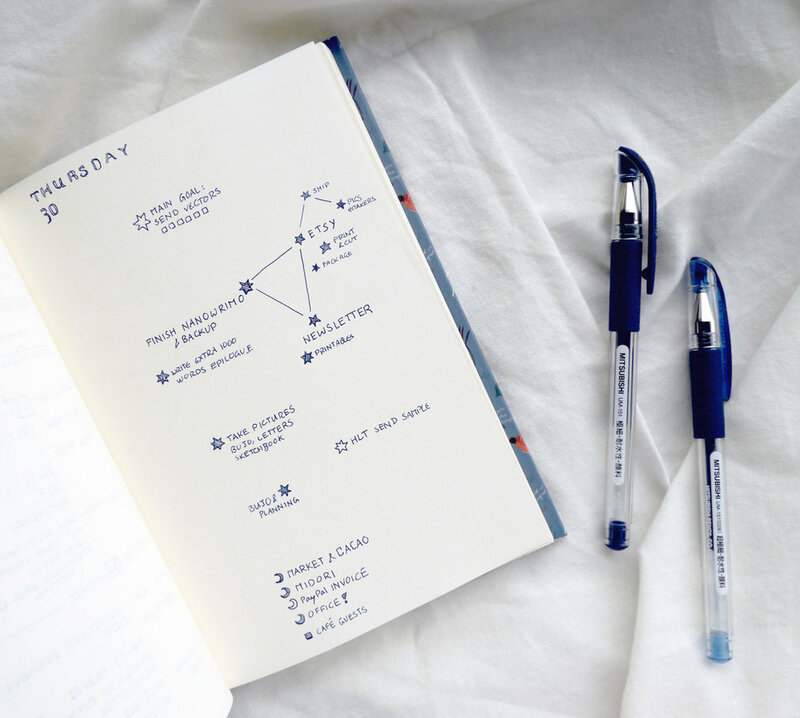 In the image showing my bullet journal above, you can see individual stars for tasks that I needed to complete. Thanks to the Pomodoro technique, I was able to estimate how long each task would take me, and I created sub-categories based on those estimates. Having little portions that I knew could get done in 25 minutes, max, was way more motivating than just one huge, looming task! Starry sky weekly layout in my bullet journal, combined with the Pomodoro Technqie. All the unnamed stars aren't part of the to-do list but mark a Pomodoro session spent on the task. Case in point: Finishing up this blog post about productivity tips and Pomodoro BuJo layouts this morning took me three sessions. I'm also very easy to distract. While I like to think of myself as a productive person in general, often enough that productivity goes towards projects or work that aren't that high on the list of priorities. Productive procrastination is useful but not ideal when a deadline or two (or three) approach. Working from home presents me with so many ways of (productive) procrastination. I could clean, or meal-prep, or draw, sketch, and write for projects that aren't yet due but interest me more than whatever is at the very top of my to-do list. I'm sure you know the feeling! Whenever I find myself tackling random tasks instead of the top of my to-do list, I kick off a more focused and productive work day with one or two Pomodoro sessions. Near the end of November, I'd hit a wall when it came to productivity. There were just too many different projects I had to keep track of, and I felt overwhelmed at the beginning of each day. Whenever that happens, my bullet journal layouts get more creative. 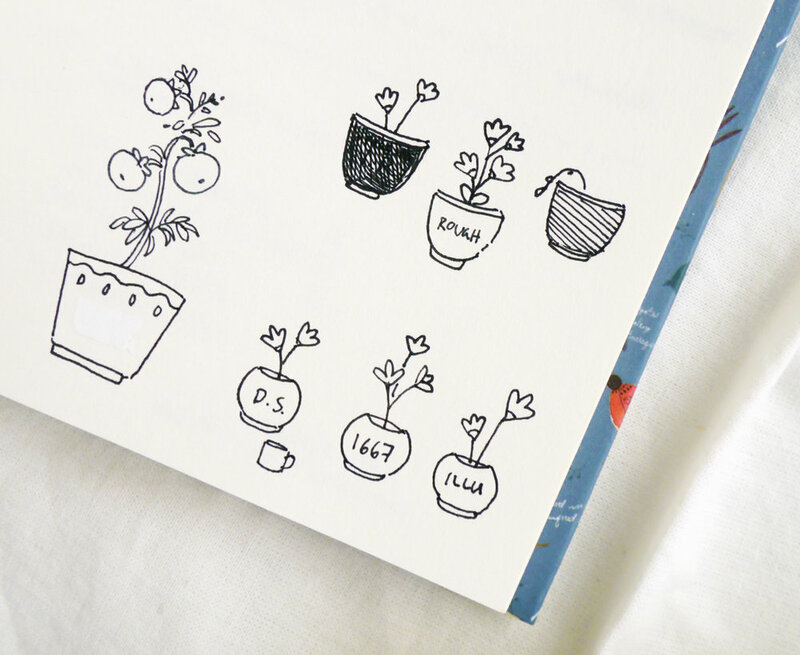 It's a way of self-reflection and optimization, which is how I came up with these cute little Pomodoro doodles. Each Pomodoro session - so, each 25 minute session of concentrated effort - I'd draw one flower. The metaphor of growth through work appeals to my romantic soul. A quite detailed record of how I spend my time. The last point was especially helpful when it came to commission work. Based on the Pomodoro sessions on that day, I was able to estimate my overall work time for future projects with the same employer much more accurately, even if I was paid per project and not on an hourly basis. ... for more bullet journal ideas and my Library of printables. The 1667 pot is, by the way, referring to the 1667 words that needed to be written per day during National Novel Writing Month. For more productivity tips for creativity and writing, in particular, you can find my NaNoWriMo Survival Guide here. Of course, not every single task in a day needs to be in a Pomodoro batch. I still did my usual productive procrastination on the side and sketched while working a short cafe shift, but the Pomodoro sessions for my main tasks made it easier to switch back and forth between a vague, creative mindset and a more focused, productive one. One major task. This doesn't have to be the most pressing one, just a long-term project that needs to be tackled for several hours - every spare minute goes into this! Three time-sensitive tasks. Ranging from one to two hours, these three tasks are what I usually work on in the morning. In contrast to the Major Task, these take less time but need to get done on that very day - mostly these are about finishing up commissions, sketches, or - that particular month - daily writing. Little Things: Tasks that take less than one Pomodoro session. Writing invoices, answering emails, preparing Etsy shipments - stuff like that. I find that when I plan more than those three time-sensitive and the one major task (plus a random assortment of smaller tasks) I usually can't get everything done in one day. This also helps when planning my week: As soon as I've got too many major tasks piling up near the end of the week, I know I have messed up and need to get started early on with late nights and early mornings of extra work so that I won't get overwhelmed on the last day. On this page in my bullet journal, I took the Pomodoro technique plants to the next level with some actual tomato plants. They didn't really fit with the smaller task doodles, but I like how the tomatoes look on the Major Task plant. You can also see that on this particular day, my smaller tasks took up a lot more time in proportion to the major task. It happens - a rough draft takes longer than expected, or a large task turns out to be less time consuming than feared. The one pot with the withered plant is really just that: Failure. I didn't get anything done for that particular task. Another Pomodoro example page, a little less doodle-intensive and more minimalist (though messy). Tuesday and/or Wednesday is usually my day off at the cafe, and since grocery shopping and art shop visits were waiting for me, it wasn't worth it to create an elaborate daily spread. I then tried to minimize the next two days to fit on the same page. Friendly reminder: My journal for most of 2017 is smaller than an A5 and very often gets messy thanks to that. Wednesday was NOT my day, with everything going wrong from printer malfunctions to delayed orders and disappearing blog posts. The square boxes were my to-do list tasks, the little moons my Pomodoro sessions - before I gave up on the day and just painted all afternoon to at least get something done. But I actually enjoy the combination of task boxes and Pomodoro symbols combined like this. If I need less than one Pomodoro session, I can just cross off the task. If it takes longer to get it done, I've got the simple instant satisfaction of at least marking another productive session. While I'm still experimenting with layouts to include the Pomodoro technique in my bullet journal, I'm a long-time fan of the productivity technique itself. Create one or two (or ten...) playlists of music (I like movie soundtracks for focused work) with exactly 25 minutes of play time. While painting or drawing (or other "mindless" tasks) you can listen to audiobooks and the Audible app has a sleep timer function. Set to 25 minutes, voila! Use a Pomodoro app. I still love and use the one I introduced here, nearly a year ago. As I'd mentioned here, I love Study With Me Youtube videos. Some have the perfect length for Pomodoro sessions and are wonderfully relaxing (and give that sense of cameraderie thanks to working "with" someone else). I hope this post gave you some ideas for when you're in a productivity slump or just want to mix things up with more doodles in your bullet journal! Sign up to get the password for my printables library.